Well, that puts your average DSLR to shame. 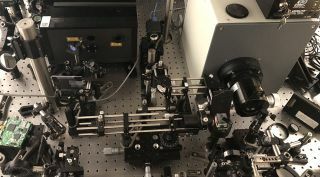 The world's fastest camera has been created and it's all down to the folks at INRS University in Quebec, Canada and Caltech, the California Institute of Technology. They have created a camera that can shoot 10 trillion images a second. Many cameras are capable of 5fps burst mode, and 30fps shooting is the norm, but 10 trillion images is, well, something else. It's so fast it can show light in slow motion. To get a camera to shoot this fast, the creators had to use a technique called femto-photography. This is where ultrashort pulses of light are used to capture an image. But there was an issue with image quality that had to be fixed - so they came up with a plan to use two cameras. “We knew that by using only a femtosecond streak camera, the image quality would be limited,” explained Professor Lihong Wang, the Bren Professor of Medial Engineering and Electrical Engineering at Caltech and the Director of Caltech Optical Imaging Laboratory (COIL). The hope is that this type of photography will break new ground in medical and scientific research - so we wouldn't expect the features to head to a Nikon or Canon camera anytime soon.